Gartner, Inc. released the results of its annual Supply Chain Top 25, identifying supply chain leaders and highlighting their best practices. Unilever held on to the top spot for the third year in a row, followed by Inditex, Cisco, Colgate-Palmolive and Intel. Home Depot re-entered the rankings while Novo Nordisk and Adidas were included for the first time. 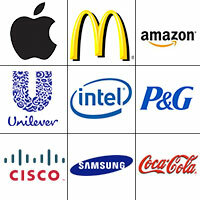 McDonald’s joined Apple, P&G and Amazon in qualifying for the “Masters” category, which recognizes sustained leadership over the last 10 years. McDonald’s skillful orchestration across a global network of strategic suppliers, service providers and thousands of companies and franchise-owned stores was cited as the secret to their success. Additionally, the fast-food firm is also experimenting with digital supply chain technologies like augmented reality to manage storerooms, so staff can spend more time with the customer. 22 The Coca Cola Co.
Three key trends stand out this year for supply chain leaders that are accelerating their capabilities, separating them further from the rest of the pack.